John and Bridget met when she moved to Barrington, Northwest suburb of Chicago, her senior year, but they didn't date until they graduated from Barrington High School in 1992. Bridget was getting ready to attend SIU, when John decided to declare his love by painting "I love Briget" on the street in front of her house. John, who was going to be leaving for ISU to study English, realized that while he was dodging the oncoming traffic he had misspelled her name. So he went back and did his best to get the "d" in. That morning Bridget's Dad woke her up to show her. She knew that it was from John and she headed to his house. When she arrived John still had paint all over his hands. Come to find out he used some pretty heavy duty paint and his declaration of love could still be seen on the street eight years later. After two years of college they married and moved to Macomb. Bridget attended WIU and received her Bachelors Degree and then her Master's Degree in Recreational Park and Tourism Administration. She works full time at Argyle State Park. John received his Bachelors Degree in English from Northern University and received his Masters Degree in writing from WIU. He took a position with the La Harpe school district in 1997 teaching Jr. High Literature. They now feel overwhelmed when they go back to Chicago for a visit saying they feel safe here. 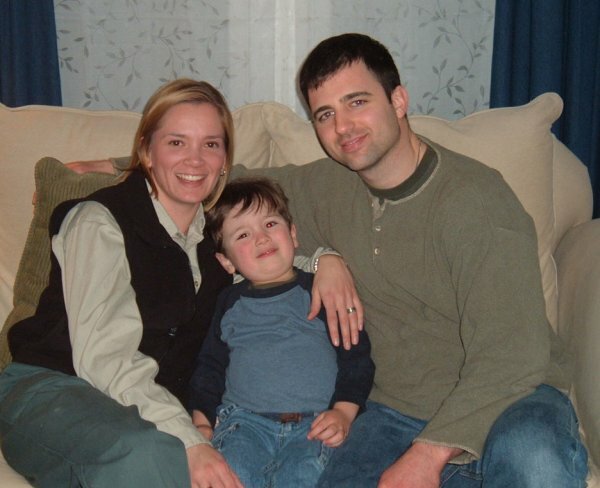 In December of 2002 they had their son Luke. He enjoys the outdoors, and loves to go out to the reservoir and fish with his Scooby Doo fishing pole. At home he enjoys Bob the Builder and Land Before Time and helping Mom in the kitchen. John teaches writing at John Wood Community College and is currently working on a novel for young adults. He has published several dramatic and fictional pieces, and a book of seven short stories titled "American Floater", which can be found at our local library. The family likes to go on walks and bike rides, and spend time outside. They often will pack a lunch and head out to the La Harpe Reservoir for a picnic.